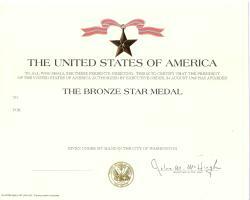 Genuine Army Bronze Star medal Award Certificate with raised printing on the front of the certificate on the medal and seal. The seal and medal are not imbossed on this one. Some small bends along the top of the certificate.